There is a vigil in Bristol today Saturday 10 January to show support for the victims of the Charlie Hebdo attacks in Paris. People are asked to gather today at 2pm in the centre of Bristol outside Hippodrome. Families are welcome and those attending are asked symbolise the event with anything they wish, banners, flowers, placards with ‘Je Suis Charlie’, or a pencil as “a symbol for our fallen cartoonists”. The organisers’ Facebook page references a quote originally attributed to Voltaire: “I disapprove of what you say but I will defend to the death your right to say it”. There is a vigil in Cardiff tomorrow Sunday 12 January at 6pm at The Senedd, The National Assembly for Wales in the Bay area of Cardiff. For directions to The Senedd see the link below. 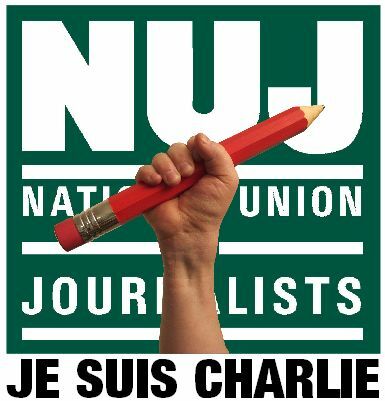 NUJ to lead march in Paris.